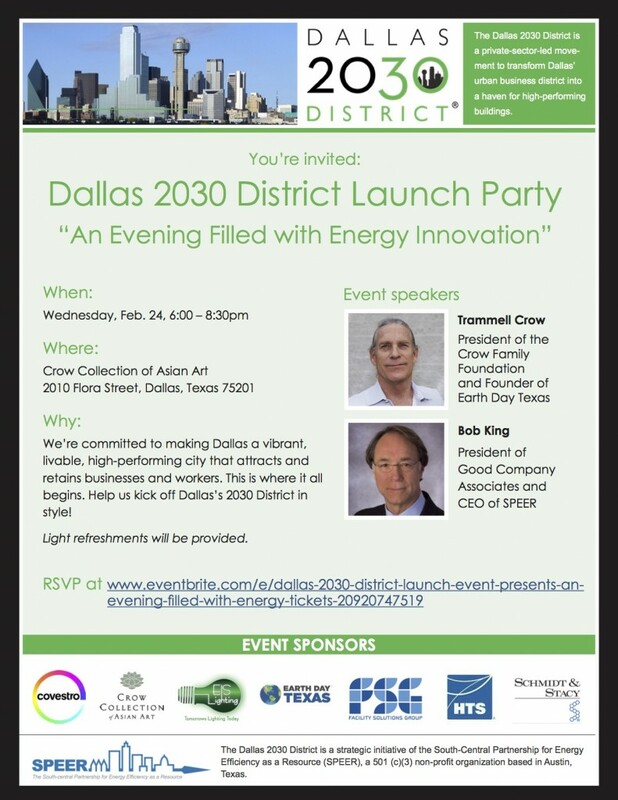 Don’t miss An Evening Filled with Energy Innovation presented by Dallas 2030 District. The event will be held on February 24, 2016, from 6pm-8:30pm at the Crow Collection of Asian Art, Downtown. You will enjoy appetizers, light drinks and guest speakers, Robert King and Trammell S. Crow. Robert King is the founder and CEO of SPEER, the Southcentral Partnership for Energy Efficiency as a Resource), one of the nation’s Regional Energy Efficiency Organizations (REEOs). Under his leadership this young organization has grown from an idea to a staff of over a dozen with 50 industry members and ongoing partnership with the US DoE, delivering energy efficiency education and support to individuals and organizations in Texas and Oklahoma. He is also president of Good Company Associates (www.GoodCompanyAssociates.com), which for the last 25 years has worked with utilities, clean energy technology companies, electric markets. A recognized thought leader, and advocate, for appropriate, emerging energy technology and evolving technology policy, Bob is also President of the Gulf Coast Power Association (www.gulfcoastpower.org). Prior to these roles, he was a state official in Texas and California focused on natural resource policy, launched and managed utility efficiency programs at the TVA, was a VP of what is now Navigant Consulting, and helped lead the development of the first commercial wind farm in Texas. He is a registered engineer and a registered lobbyist. Trammell S. Crow is the President of the Crow Family Foundation, which operates and manages The Trammell and Margaret Crow Collection of Asian Art. Mr. Crow is a long-term supporter of the Texas Conservation Alliance, the Nature Conservancy of Texas, Texans for Lawsuit Reform, the League of Conservation Voters and Founder of Earth Day Texas. He supports various non-profit organizations that are active in family planning, education, the environment, community initiatives and political causes. The Dallas 2030 District is a voluntary initiative of downtown/uptown property owners including the City of Dallas. In short, the goal is to reduce energy and water consumption 50% by 2030 through collaboration and training. For more information, visit www.2030district.org. Dallas is one of 12 such districts throughout the U.S. with more on the way.